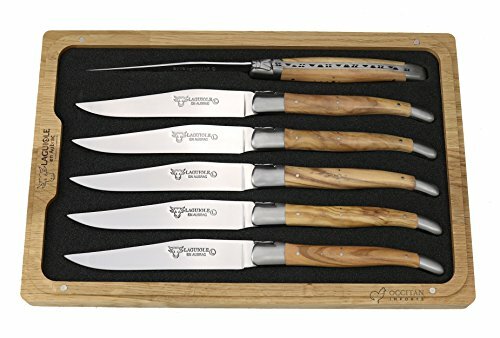 Set of 6 heirloom-quality, handcrafted French steak knives with olive wood handles, shiny stainless steel blades, and matte finish stainless steel bolsters. Blades are made of Sandvik high performance knife steel, which allows for razor sharpness, high hardness, exceptional toughness and excellent corrosion resistance. These knives are handmade by highly skilled artisans in the vicinity of Laguiole (region of Aubrac) in accordance with the region's knife-making traditions. Each knife is a work of art, handmade by a single craftsman. Each displays the traditional "shepherd's cross" on the handle and "bee" at the top of the spring plate. Exquisitely shaped and perfectly balanced, with a design that has been refined by generations of cutlers, these knives will be in your family for generations as well. Because the handles on these knives are made of natural materials, each one has its own unique personality, so the ones you receive may not look exactly like the ones that you see in the photos - this is part of what makes these knives special. It also makes them afraid of dishwashers - please hand-wash them with a mild dish soap and wipe them dry with a soft cloth. Presented in an elegant, high quality, wooden box. Made in France by Laguiole en Aubrac. View More In Steak Sets. If you have any questions about this product by Laguiole en Aubrac, contact us by completing and submitting the form below. If you are looking for a specif part number, please include it with your message.